One of the better known apps we at Pervasent have developed is the Zinio magazine reader app. For a while it’s been in the top 5 of the Top Grossing iPad Apps on the App Store. Duking it out with Apple’s Pages app, Angry Birds and Smurfs’ Village for the top spots. Recently the Zinio app was awarded the “Best Global App” by the Internet Marketing Association at an award ceremony in Las Vegas. The event was opened by the Mayor of Las Vegas and streamed live to 11k people (out of IMA’s 350k members). So sounds like a pretty big deal. I’m not sure what the selection criteria was, or who the competitors were. But it doesn’t get much better than being the best global app. Nice! On Wednesday June 29, 2011 my colleague David Foote will be conducting a webinar for iOS developers. If you want to learn how to create an automated build process for iOS projects, this webinar is for you. Are you currently building applications for Apple’s wildly popular iOS platform, or planning to do so in the future? If so, it is important to understand the unique lifecycle management challenges you will face in iOS app development for mobile devices and the solutions available to overcome those challenges. Aldon and Pervasent invite you to attend a webinar on how to create an automated build process and application distribution system that will accelerate the development and testing of your iOS applications. Managing the build/test process during application development is one of the great challenges of developing iOS apps. Builds are typically created by hand. Mobile provisioning profiles containing the device IDs of all testing hardware must be created and distributed to testers and executive stakeholders. Each new build must be installed on each testing device by attaching it to a PC running iTunes. These manual processes are time-consuming and error-prone. During this webinar, you will learn how to create an automated build system that will enable anyone in your organization to dramatically simplify the build and deployment process within the iOS application lifecycle. I am fortunate to be in a position to be selective about the clients I work with and the projects I work on. The project has to have some difficult technical challenge to satisfy the inner geek. But equally important is that the resulting app should do something good, something that helps people, and maybe make the world a little bit better. An app that I recently completed fits these criteria perfectly. The app is called NutriSleuth and in a nutshell it allows people with allergies or other medical conditions to check out food items in the grocery store to see if they are going to make them, or anyone who they shop for, sick. The app scans the bar code of a food item and uses the UPC to lookup the product in a database stored on the device. The database contains over 200,000 food items and over 2.5 million nutrition records. The database uses Core Data and its total size is over 500 MB on the device. Herein lies several technical challenges, and I’ll be writing a few blog posts about this. The result of the analysis is a simple green, yellow, red light that indicates if you can safely eat this food item, if you should exercise caution or put it back on the shelf immediately. Some people go into anaphylactic shock when they are exposed to certain food ingredients like peanuts, tree nuts, eggs, etc. This severity level can also be configured in the app and then the nutrition and ingredient analysis goes into hyper-vigilant mode. The app does not just handle food allergies. Say that you have a friend who’s coming over for dinner and she has Crohn’s disease or a high cholesterol condition, or only eats vegetarian or only Kosher food. What can you safely serve for dinner? Setup a separate profile for you friend and scan away. The app received a lot of press even before it was launched. I think the reason is that you instantly recognize that this app would be very helpful (potentially a lifesaver, literally) for so many people that have food allergies or other common medical conditions. I’m proud to have been part of this project. And being able to do something really good like this, is one reason why I love being an iPhone developer. You can check out NutriSleuth in the App Store now. So, I was exiting the Castro Street MUNI station, taking the escalator up to street level. I had my book bag over my shoulder behind my back and my iPad in my hand. I decided to hop up the last few steps and tripped hard on the last step. As I careened towards the ground (I knew I was going down) I put my left hand out and realized it contained my iPad. Rather than let if fly or shatter it as I put my hand down, I launched forward and planted an exaggerated right shoulder roll, cradling my iPad like a football. It never touched the ground. I stood up on my knees, embarrassed, laughing and letting others around me know I was okay …. but it was really about my iPad. Today the Zinio app rocketed up to the #1 slot in the News category for free apps. It is ranked ahead of NYTimes, Yahoo!, NPR and USA Today. Pretty cool. The app allows you to read magazines on your iPhone. The magazine pages are rendered just like they appear in the dead tree version of the magazine, or you can select a text mode where you lose the overall layout of the page, but the text fills the screen and is much easier to read. If you live outside the United States then physical magazine subscriptions from the U.S. are typically very expensive due to the postage. (You used to be able to select surface mail, which was much cheaper. But then it took three months for the magazine to arrive. I always wondered what kind of surface vessel took 3 months to cross the Atlantic to Europe. I guess those ships have been retired because surface mail is no longer an option.) With a digital subscription from Zino you get the bits immediately and for a much more reasonable price. And you can read the magazines on your iPhone, another mobile device, or on your computer. It’s a really nice app. Check it out. I was part of the team that developed the People Celebrity News Tracker which launched last week. It has since then hit #13 on the top list of all paid apps. 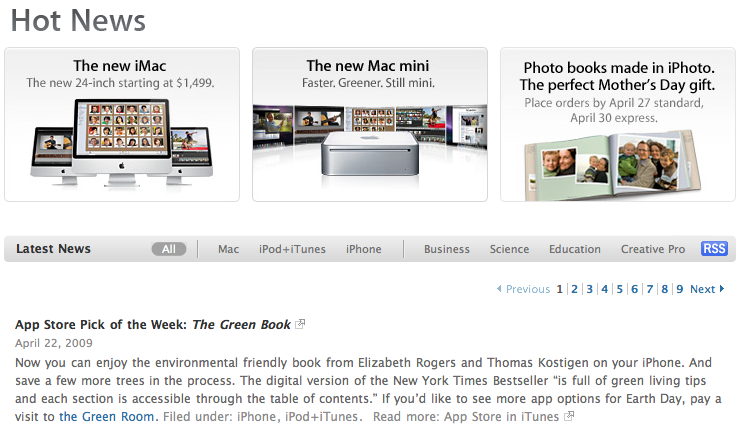 Apple’s promotion of the app on the App Store home page was a nice endorsement, and no doubt helped the sales. If you search for “celebrity” in the App Store the #1 search result is the People app. And #3 is another app that I worked on: Funniest Celebrity Quotes, Jokes & Bloopers. I’m honored and humbled to have created the App Store Pick of the Week. Please check out The Green Book, a real book bestseller published on the iPhone using the TRIBE reader. 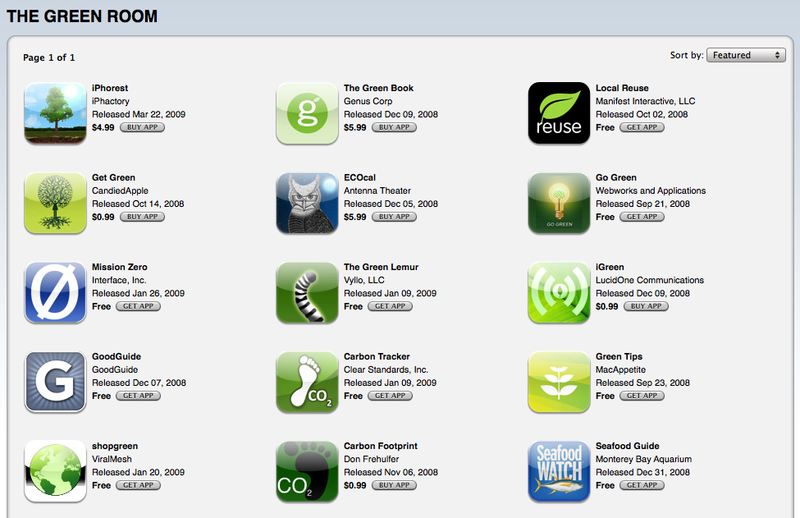 Apple has created a new Green Room section in the app store in time for Earth Day. And The Green Book is also featured here. That gives me about a 0.8% share of the number of apps, which is the same as when the App Store launched. So I’m keeping pace with the growth of the App Store!